Life in BG » We *heart* Plovdiv. Plovdiv should be called P-love-div. It is such a beautiful city. We loved visiting, and we will definitely return! Some Plovdiv background: Plovdiv is the second largest city in Bulgaria, second behind Sofia (where we live). The Ottoman Empire (the Turks) controlled Bulgaria for 500 years, until the Russians helped free Bulgaria from Turkish rule in the 1880s. 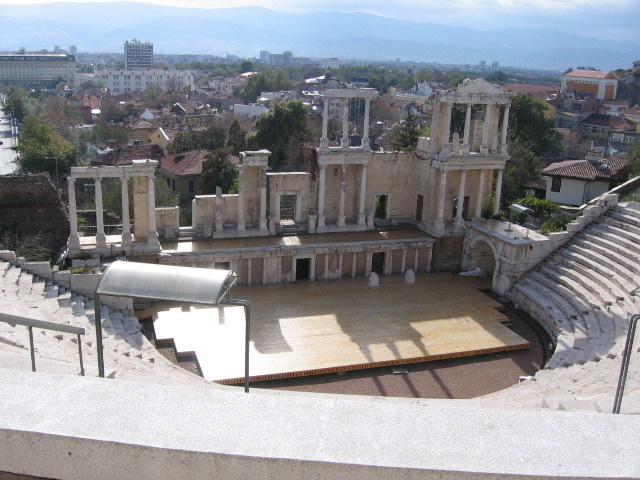 Unfortunately, at the time the first treaties were being signed, Plovdiv was still considered part of the Turkish Empire, so it was NOT named the capital of Bulgaria. This is their claim to fame, that they should have been the capital city. 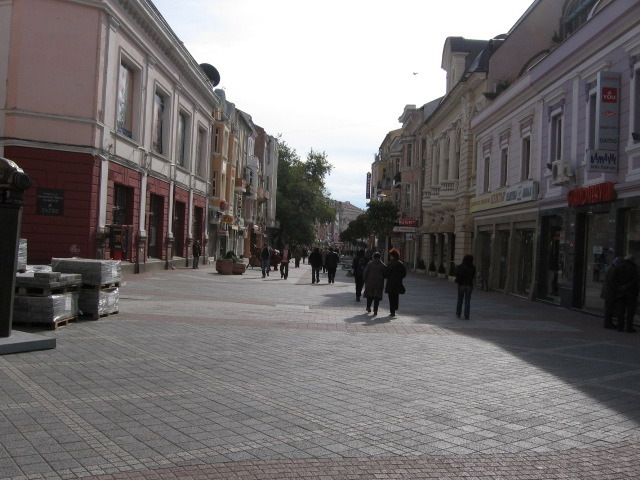 Plovdiv is the Sausalito of Bulgaria. It is where the artists and intellectuals hung out, but sadly, were killed during the Communist era for being against the regime. Think reverse McCarthy-ism. Now, they have a beautiful center of town with clean streets and brightly colored buildings. There is a whole area where cars are not permitted, so the streets art clear for walking. 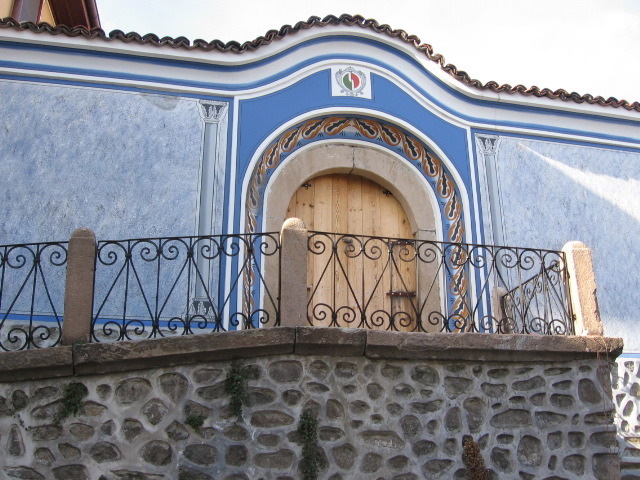 There is also a section called Old Town where they have preserved the history. 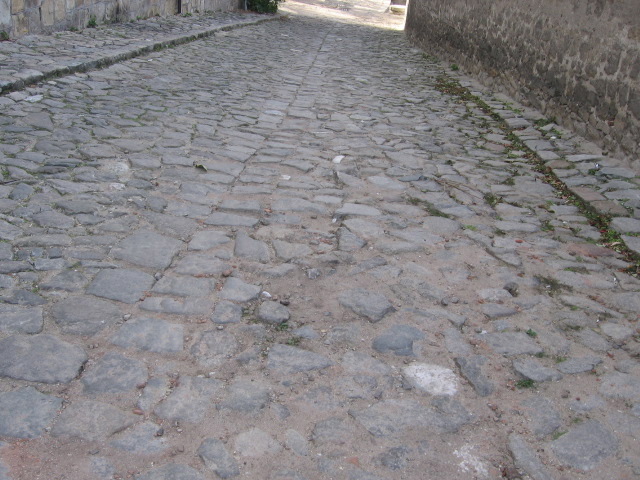 There are the original stones laid by the Romans during the Roman Empire and traditional Bulgarian houses from the Ottoman Empire. On Saturday afternoon, we took a bus from Sofia to Plovdiv, which took about an hour and a half. When we arrived at Plovdiv, we went to our hotel and checked in. One small problem, we didn’t bring out passports and the guy didn’t believe we lived in Sofia since we didn’t have address cards (what are those and how do we get them????) But since we were only staying one night, he let us in. Well, we had planned to meet some of my new American friends who were also in Plovdiv later in the night, but come to find out, some of Mark’s friends were also in town that night. What a coincidence!! We met two of his friends—one American and one Bulgarian—for dinner and then we went out to play pool. Then we went out afterwards with my friends. 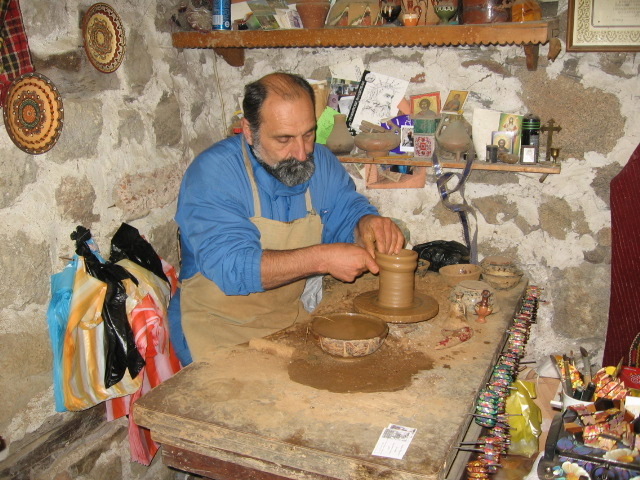 While we were there, a potter came out and offered to give us a demonstration of how he makes his pots, cups, etc. He showed us in his book where he had done a demonstration for the US Ambassador and explained how the clay comes from the nearby river, the River Maritsa. Of course, we bought a few items from him. This was one of the best parts of the day. He works in a little shop and sells his creations. And he had a speech in English that he knew and described everything that he was doing. Then he slammed one of the vases on to the table to show that it WILL NOT BREAK!! I already knew this because before I left I had taken a pottery class and I learned that little fact. Having tried pottery myself, it was extraordinary to watch this guy make a perfect milk vase in 2 minutes. My greatest achievement was a soy sauce dish that took 8 weeks to master, and even then, it was uneven! So I was very impressed. After so much walking, we decided to have hot chocolate in a café and then shop for snow boots. I did not find any I liked (will have to look when I come home), so we left and headed to the bus stop, where we met up with some of my American friends. Now all this may seem amazingly coincidental to you, but Bulgaria is a very small country, so it is not unlikely that you will run into people you know. We were lucky to have a Bulgarian with us during our tour because she could explain to us what everything was. Otherwise, we would have had to rely on guide books which don’t have as much information. One thing Mark and I have both noticed is that people here know their history well. Any Bulgarian could tell you about the main events in their country’s past, and they have thousands of years of history. It makes me that much more sad that so many Americans don’t know our basic history and we are only a couple hundred years old…. To sum it all up…we loved Plovdiv, and now call it P-love-div! We will definitely hang out there again! 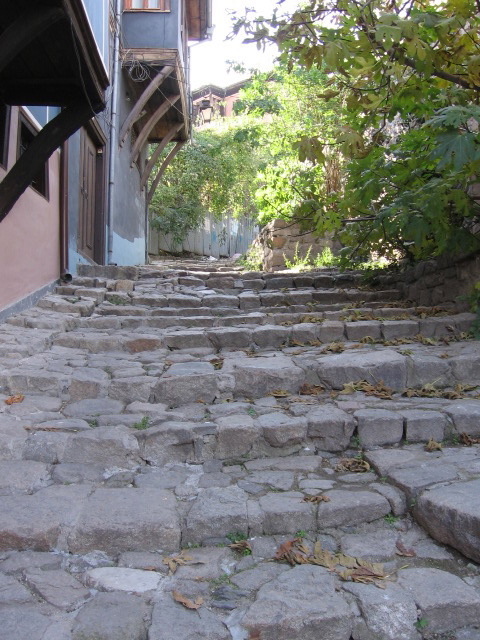 Plovdiv has some of the most beautiful scenery around, from the Roman amphitheatre to the Maritsa River flowing throudh the heart of the city.